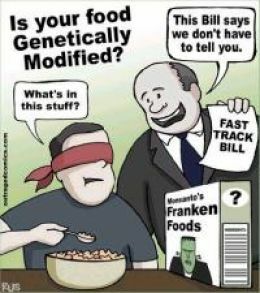 I don’t know a whole lot about genetically modified food, but I can’t say as I’m opposed to the idea in general. Sure, people say that eating it could turn you into a slug, but that’s ridiculous. The formula to turn a person into a slug is carefully guarded by the League of Evil Wizards. It seems that, whenever there’s a new technology, you’ll get people talking about how it’s dangerous and will ruin the world. That said, while the idea may be sound, I’m not sure about the specifics. It doesn’t exactly fill me with confidence that the majority of food modification technologies are owned by Monsanto, a company known for manufacturing poisons and dumping toxic waste. And there’s the current debate over whether to label genetically modified food, which I don’t even see as an issue. Of course you should let consumers see what’s in the food they’re eating! The movement NOT to label such food is apparently based on the idea that people won’t buy it due to paranoia over genetic modification. That could be true, but so what? Why shouldn’t consumers be allowed to make their own decisions? Trying to trick people into eating things they wouldn’t normally eat might work for parents of five-year-olds, but for companies catering to adults it’s just unscrupulous. It looks like they haven’t done much genetic modification of animals, although there are still plenty of issues concerning the chemicals that are being pumped into them. Take Bovine Growth Hormone, another favorite of Monsanto, which is said to increase the risk of cancer as well as breast size. While my libido thinks that latter part might not be such a bad thing, it can result in back problems, and besides it can affect really young girls. Do we want to live in a society where “I’m sorry, officer! I thought she was eighteen!” is actually a valid excuse? Anyway, as far as actual genetic modification of animals goes, scientist in Thailand bred glowing pigs back in 2006. 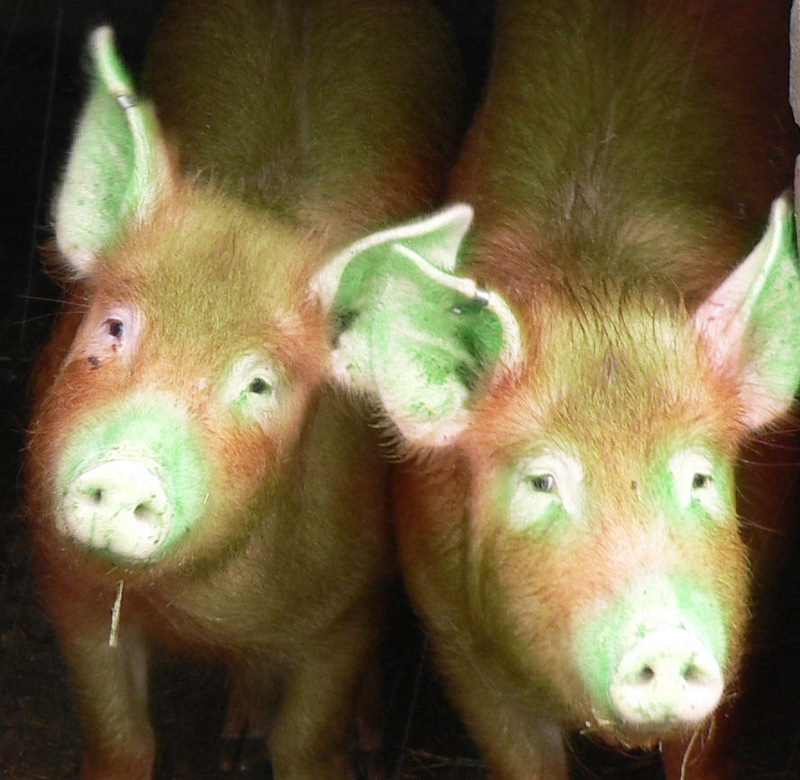 They used genetic material from jellyfish, and the pigs glowed green in the dark. You’d think you’d have heard more about this, because what kid WOULDN’T want a glow-in-the-dark pig as a pet? This entry was posted in Corporations, Food, Health, Politics and tagged bovine growth hormone, genetically modified food, glowing pigs, monsanto. Bookmark the permalink.